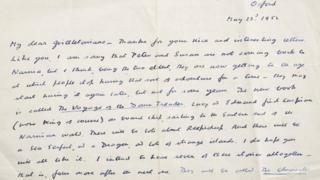 A letter written by Narnia creator CS Lewis to a group of schoolchildren is expected to fetch £5,000 at auction. The two-page letter was sent to pupils at Grittleton House School in Wiltshire on 22 May, 1952. Written following the success of the The Lion, the Witch and the Wardrobe and Prince Caspian, the letter reveals the title of the third book will be The Voyage Of The Dawn Treader. The Chronicles of Narnia has sold more than 100 million copies worldwide. Penned in the author's rooms at Magdalen College in Oxford, the letter reveals the third book will include "a Sea Serpent, and a Dragon, and lots of strange islands" which he hopes the children "will all like". It also describes his plans to have seven stories in the series and his uncertainty of how the saga will end. "What do you think would be a good thing to end the whole series with? Of course Aslan (the lion) will come into them all," he writes. He also recommends some of his favourite books and asks the pupils if they write stories as "I did at your age: it is the greatest fun". Auctioneer Chris Albury described the letter as "an absolute delight". "It is full of warmth and interest and shows a genuine curiosity to engage with the storytelling interests of these children he had not met," he said. "When he was writing The Voyage Of The Dawn Treader he thought it would be the last in the series, so the news he now believed the series would contain seven stories is new and fresh in his mind." Grittleton House, an independent co-educational school, closed in 2016 with alumni including singer-songwriter Jamie Cullum. The letter will be auctioned at Dominic Winter Auctioneers in Gloucester on 12 September.